Oh unslaughterable cow! Salutations to your beauty appearance". This is how the Indian cow is described in a cow-centric website. In Indian mythology, the geographical space which the cow occupies "with happiness and joy" becomes as sacred as the holiest pilgrimage and "even the dust of that place becomes pure". The chanting of Vedic scriptures, the cow, fire and the mediating agency of the priestly caste of Brahmins constitute the four crucial corners of this holy spectrum. All these 'sacred elements' are compulsory in the performance of the elaborate rituals of the religious yagna. Since ghee is essential to this Hindu ritual and symbolises vitality, good health and long life, the cow constitutes a crucial cog in this circular logic of divinity and material life. The cow is revered for other reasons too. The space where the yagna is performed is believed to be purified by sprinkling cow urine and cleaned and pasted by cow dung. The last is also presumed to be a disinfectant, a hygienic spiritual reassertion against physical impurity. Fire and cow dung, along with camphor and incense, is integral to the recitation of the mantras. Though these rigorous rituals are often not followed in modern times, according to the normative code of the yagna, the host who performs it was traditionally asked to purify himself by drinking Panchagavya, a mixture of five cow products: curd, milk, ghee and cow urine and dung. According to the cow myth, milk is satvaguna (most pure quality), the cow fulfils all human wants (as Indra's cow Kamadhenu), the Ganga 'resides' in the cow's urine and dung can fight plague and cholera and is an antidote to snake and scorpion bites. Some cow worshippers even believe that wartime houses with cow dung "are least damaged by bomb attacks". 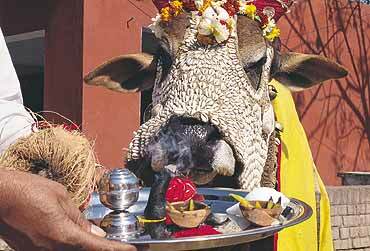 In many parts of the country, the entire cow family is worshipped, including the ox and the bull. In the south, Shiva, accompanied by Nandi the bull, is widely worshipped. During Mattu Pongal or 'Gopuja' in TN, the entire cattle family is worshipped; their horns decorated with flowers and painted, they are given ceremonial baths and aarti performed. This proves that not just the cow, the entire 'cow family' is worshipped and protected. By that logic, not only cow slaughter but that of buffaloes or bulls is prohibited too. Ironically, cow worshippers are focused only on the Indian cow. A Jersey cow does not fall into their scheme of things. Besides, while the upper stratum of the caste structure worships the cow, many lower castes, tribals and communities within Hinduism don't consider the cow 'unslaughterable', though they respect cow worship as a religious right in a pluralist society. How now, brown cow? The political class is in a holier-than-thou debate over a mute creature. Why Not A Man Slaughter Ban?